The Maplewood Steak ‘n Shake closed in January along with others in the St. Louis area with little explanation or warning to its employees. The Maplewood location posted a sign that it’s closed for renovations. Online, though, Steak ‘n Shake is seeking franchisees for 400-plus locations. 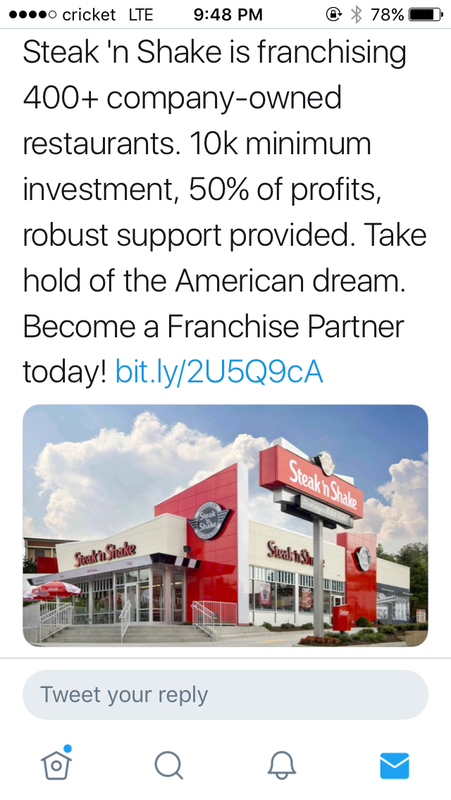 I have some news on Steak ‘n Shake. I have a friend that manages a location in Florida and I reached out to him and he said the St. Louis market was struggling and the locations that are closed right now are gonna be pick up only locations. No dine in! I don’t wanna go on record but that is what I know. I will miss a convenient, family breakfast place, burgers, shakes, etc. It has been there from my memory for at least over 50 years. Also, my guess is that the closed places were corporate owned and they are into franchising now. Certainly in need of closer monitoring. Yes, it would be all about how it is run, but a franchise must sell products and use supplies from the mother company, etc. I would like to see it reopen. I think they could make it work by going back to the original concept. A burger restaurant. Open from 11 AM to 1 PM, 2 PM on weekends. Forget about the breakfasts, the 1/2 price Shakes all afternoon, and the all night service. I wonder if the same company or person owned all the closed ones in the ST Louis area. And if anyone has been to the other ones that are now closed to see what service and cleanliness and food was like. Might have been a similar way of doing business at each of those stores. i think this is a good guess. I don’t miss them. I had nothing but poor service and bad attitudes every time I went there. There are so many better options around town. I hope the employees leave town, too. Good riddance! What they really should do is offer valet parking. When activists push for $15/hr, citing high executive pay, they ignore the fact that restaurant workers work for the franchisees, not corporate. I don’t see how one can make money selling double steakburgers with 2 sides for $3.99. So sell them for $8 and pay your employees. It’s not that hard. Hi Javier! That’s some pretty good Alexandria Ocasio Cortez magic economics. How about selling them for $16 and doubling employee pay? Would that be hard? I’m guessing you’ve never run a business. Charging $8 a for a burger, two sides, and a drink or whatever they are doing is not unreasonable. It’s actually a workable business model, which their current model is not. Not sure how basic economics of product costing to be able to operate and maybe make a profit became socialism. Huh. So where did you go to see their books? I’d like to have a look too. Turn off the news rick and maybe you won’t feel the need to bring up your scary boogeyman AOC for no reason at all in random comments. She’s really got you guys scared huh? Sorry for the trigger guys. I just used her to represent general lefty economic idiocy. Nothing personal. I could have chosen any one of the hundreds of loons out there. When you close the doors and turn off the lights, customers will drift away to other fast food places and may never come back. And the way the treated the employees with a last minute notice will leave a bad taste (no pun) in peoples mouths. An investor would have to think twice before buying a franchise at one of the shuttered locations. I must be an exception to your rule. I go back to a S n’ S.
i disagree. if they re-open with new owners and provide food and service at the level that is expected, people will go back. The Franchise ads have been in the Post Dispatch for some time. They say locations are closed for remodeling,, I’ve been by the Maryland Heights & Page/Ashby location. Barricades not moved, nobody inside working & no trash dumpsters. I say closed.